One alternative way to practice English is by using social networks. Who could deny the usefulness of social networks like Facebook? You can communicate, read posts from friends, watch videos, and do it all in English. This is not the language of books, but rather the authentic language that your peers who live in other parts of the world use every day. Perhaps these peers even share the same tastes and interests as you. 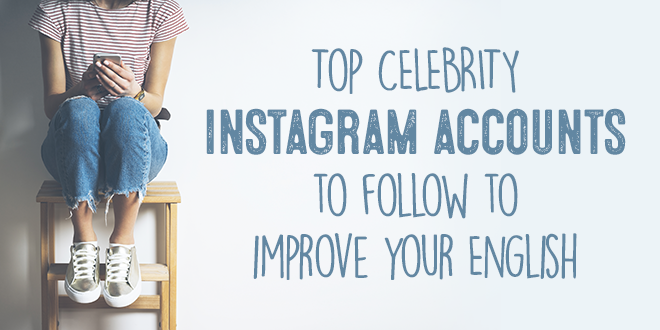 @abaenglish suggests 10 can’t-miss Instagram profiles to help you learn English. What can we say about Instagram? Instagram is a social network where only pictures and videos can be shared. Did you ever think it could be useful for practicing your English? Today we will answer this question by presenting 10 Instagram profiles with interesting content in English. Jamie Oliver is a famous English chef who has opened many restaurants in London. On his Instagram, there are a lot of photos and videos with some of his recipes as well as informative videos about child nutrition and tips related to the cooking world in general. His profile combines tradition, innovation, attention to details and health. If you love to cook and want to improve your English, leave comments about the recipes or try to follow one of the recipe videos. Huda Kattan is the most famous beauty influencer in the Middle East. Her Instagram has more than 4 million followers. For her, makeup is the best way to highlight the beauty that is already present in all women, inside and out. If you love glamour and are always looking for advice, her tutorial videos will really interest you. Charity Water tells stories of success and life changes with the photos of the people involved. This is thanks to the commitment of the organisation to bring clean, safe water to countries that need it. The English texts tell the stories of the protagonists of these small, but great achievements. This non-profit organisation’s profile has a lot to teach, not only to those who love volunteering but to all of the associations that use Instagram to defend their causes and spread their messages. Here is the link to see what it is about. Like all National Geographic products, their Instagram profile combines beautiful images with interesting content of great scientific rigour. Each image is accompanied by a title in English which describes the image and informs readers about important social and environmental questions. This is the perfect profile to follow for all those who love nature and the world surrounding us. Visit it using the following link. This profile is ideal for interior design lovers and offers many suggestions about how to decorate your home to make it unique. The ideas presented in the photos are captured in different parts of the world, from South America to Spain, from the rural style to the exotic, from the Mediterranean to the postmodern. If you want to add a special touch to your cottage in the mountains, to your mini-apartment in the city, or to your terrace with sea views, this profile will really interest you. Find the inspiration you are looking for at the following link. Rachel Ryle’s profile offers many ideas for creating greeting cards in English. Her stop-motion videos not only show images that capture our attention but also tell stories. They help us to realize the importance of remembering the special moments in our lives. To admire her designs, click here. ScripttoScreen posts scenes from classic films with the script below. This is very useful for those who want to learn English through films. For lovers of the seventh art, it is very interesting to follow the most famous film scenes in their original language with the transcription of the text below. In addition to being an excellent educational tool, this profile also allows you to completely appreciate the actors’ performances. Watch Chaplin’s speech from “The Great Dictator” in its original language with subtitles. For all parents who want to instil a love of reading in their children because they find it to be a useful tool for education, this profile is absolutely necessary. It collects tips, comments, and news articles about readings and events to help raise awareness about the issue of racism to help children overcome the barriers of prejudice. Visit this Instagram profile with your children. Publications on this Instagram feature book covers, especially from novels, in a strange and artistic context. In addition to being a resource for design lovers, the texts offer many tips about contemporary readings of English authors. Visit this link to discover this profile. If you love to travel, you must visit this fantastic profile. It posts photos and videos of many fascinating places around the world with a brief caption describing the image. Some of the videos allow you to experience the streets and corners of the world in a way that will make you second-guess if you have actually been there or not. Go to this link and begin to travel. Now you know of some Instagram profiles that offer interesting content about various themes. If you are interested in English and want to improve your language skills, why not try ABA English? We offer a free course with 144 video classes, short films, and native teachers to prepare you for any eventuality! Try our ABA English course now! All articles are very useful for English learner, I feel good at learning English with confidence on this blog. I suggest all new English learner can learn English speaking with confidence.